PaperFree believes in community and giving back. Twice a year our employees volunteer their time at a local charity, foundation, or organization of their choosing. By doing this, we assist these organizations in furthering their causes, help those who are disadvantaged, and make our community a better place to be. 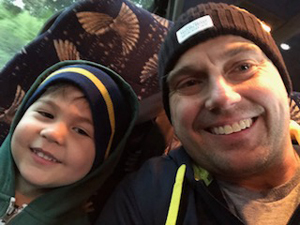 Below are reflections from our employees on their volunteering experiences. Joined a group from a friend’s church in downtown to pass out blankets and sandwiches to the homeless population. This was the first-time volunteering with this particular church and it was a little unorganized, but it is always humbling to get to talk with some of the people who truly are thankful for any amount given. For my second volunteer activity this year I participated in my church group's preparation of hygiene kits to be distributed to the homeless in downtown San Diego. After organizing all of the donations from ourselves and other church members we each grabbed a gallon-sized zip bag and filled them with items one by one. In the end, we created about sixty kits, some geared towards men, others for women, and some were generic in nature. In all, we provided the homeless with toothbrushes, toothpaste, new socks, combs, hand sanitizer, wipes, soap, basic first aid supplies, and more. Another group distributed the kits a week later. We were grateful to be able to help the health and wellbeing of the homeless with our kits! Last weekend, I helped to assemble survival bags to be passed out to members of the homeless community. These bags contain food items like nuts and apple sauce as well as toiletries like toothpaste and wet wipes. I started off on the assembly line putting toothbrushes into the bags, and then moved over to help seal and organize the completed bags. By the end, there were over 200 bags ready to be handed out to anyone who needs them. Last year I took a part in two volunteering events that help families in need. The first event was with Feeding San Diego. Feeding San Diego is an organization that focuses on fighting hunger in the city of San Diego. They do this by accepting food donations and distributing them to families in need. For the event, local grocery stores donated a huge amount of fruits and vegetables. Our task was to separate the rotten fruits and vegetables so the good ones could be donated to local families in need. The second event was with Harvest CROPS. Fruit tree owners work with Harvest CROPS to donate extra fruits to low income families. I went to one of the fruit tree owner's home to help pick oranges from the dozens of trees to donate. These tasks were fun, challenging, and well worth it knowing that it helped people in need. 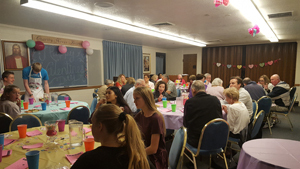 This month I had the opportunity to oversee and help the teens of my church congregation organize an annual Valentines dinner for the "empty nesters" in the congregation and their friends. We use the term "empty nester" to describe anyone who's raised a family and whose kids have left the nest and moved on, so to speak. The close-knit group runs the gamut from middle aged couples to our stellar nonagenarian Muriel, who loves dishing out life advice and a current headcount of her various degrees of grandchildren. The idea for this dinner came three years ago after several members of the congregation passed away and left widows behind. We knew that Valentines Day could prove difficult for the widows, so we wanted to provide a fun, upbeat activity with friends so they could still recognize the holiday but without emphasizing the pangs of loss. We decided that a dinner would be an excellent fit for this purpose as it gave us leaders an opportunity to teach the youth a variety of planning and food prep skills, and who doesn't love it when someone cooks for you? Preparation for the event started back in January with me teaching the youth how to make lasagna from scratch and decorate display cakes, and helping them create decorations. Other leaders who are talented in such things helped organize a musical number for the dinner as well as assisted with the overall organization of the event. I also prepared games for the event - this year was Valentine's-themed bingo and our youth were good to me and ran it while I was busy overseeing cleanup :) (I also made stained glass heart suncatchers as bingo prizes). We also prepared a way for our guests to leave some experiences and insight for the teens with cards that ask them to answer one of several fun questions, such as "What was the best date you've been on?" and "What did you think of your spouse at first?" The teens love this. In all, it's a fun event that our Empty Nesters look forward to every year and that we are happy to provide for them. My son Hunter and I were lucky enough to participate in the Wreaths Across America event held at Fort Rosecrans national cemetery December 16, 2017. It’s a special event that has people help put wreaths on the graves of service men and women. It was a great turnout, and there was a beautiful service beforehand that went through the history of the event. They detail how the event is held throughout the U.S. on various site on the same date each year. Each branch of the military was represented and spoke to the importance of the event. All in all a very powerful event, that showed you first hand the impact it had. 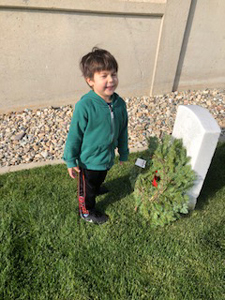 It was also a great opportunity for my son to get exposed to the sacrifices the service men and women made to allow us to live the life we live today. It also showed him the kind of impact he can have by reaching out to help when there is need. A great event that we were very happy to be a part of. I recently had the opportunity to volunteer at a mental health forum organized by Community Alliance for Healthy Minds. The forum consists of dozens of local outreach programs focused on helping people who are struggling with mental health issues, or have loved ones who are. There are booths set up to give attendees a chance to speak to some members of these various groups. Throughout the event, there are two keynote speakers and two chances to engage in a breakout session, which sets up multiple small groups focused on certain issues being faced. I had different tasks throughout the day including helping the exhibitors bring their supplies up to the main hall, directing attendees to the breakout sessions, cleaning up, and interacting with the different exhibitors to learn about the many services provided in San Diego County. My wife and I went up to the local animal shelter near us and spent the day helping. We helped to feed some of the animals, took a few out in their yard to play, and spent some time just giving some love to a few who were in much need it seemed like. This was something new for me, as I haven’t volunteered at a shelter before, but it was awesome to see the dogs especially light up to get to play with someone new. This is probably not the last time we will volunteer here was we both found it very rewarding and fun.